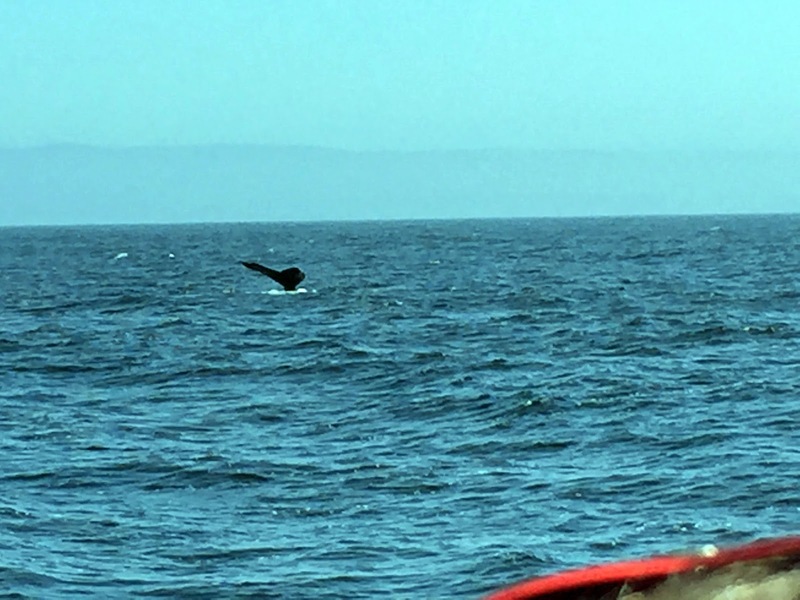 On our third day in California, we went whale watching aboard the Sea Goddess out of Moss Landing, California. We enjoyed watching all the sea lions around us in the marina, even though some of them seemed pretty stuck up. There was actually a sign on the pier as we walked on with a warning to stay away from the sea lions because they could be quite vicious. That kind of surprised me because they seem like such friendly creatures but apparently they can be a pretty big nuisance. The captain said they drive the locals crazy because they are loud and constantly damaging the docks, boats, and other property. Dang sea lions. On second thought, these creatures look absolutely terrifying. Monterey Bay is a mecca for wildlife. One of the reasons for this is right offshore from Moss Landing begins a large underwater canyon that is bigger than the Grand Canyon. The drop-off goes from a couple of hundred feet deep to something like 12,000 feet deep. That big of a hole can hold a lot of animals. The bay is known to host gray whales, blue whales, great white sharks, orca whales, and lots and lots of dolphins as can be seen here. The first thing we saw when we went out on the bay was a pod of common dolphins swimming around. At least I hope they were dolphins. I wasn't going to jump in the water and pet one of them or anything to find out for sure. Our whale watching trip wasn't the greatest as we had to spend the first 45 minutes or so hunting for the massive mammals. We were eventually rewarded with the sight of a couple of different humpback whales. They're not very cooperative at posing for pictures, though, and we have about 100 pictures of open ocean water. Avery was good enough to capture this whale tail on his phone, though, so he won the photographer's award for the day. 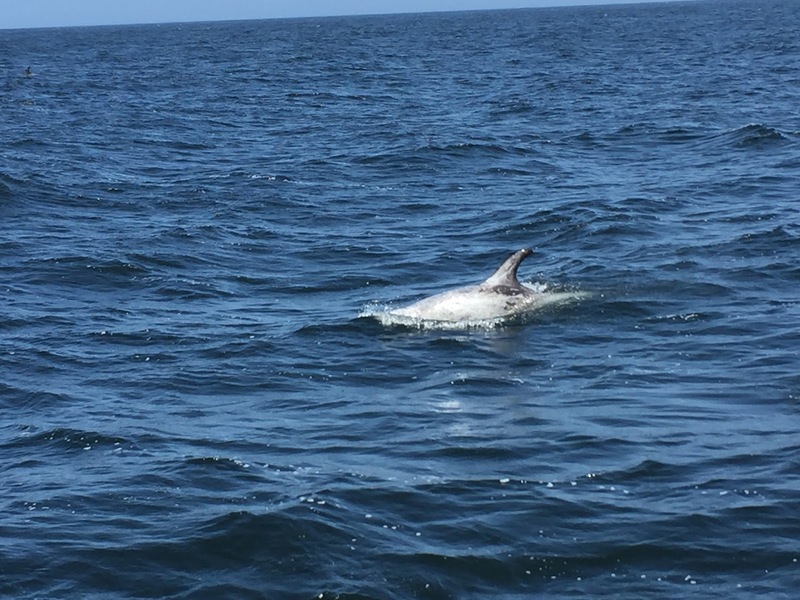 He also caught a good shot of this "Risso's Dolphin". We saw a pod of these dolphins on the way back to shore and they swam around our boat for a half hour or so. We thought that was pretty nice of them. Probably the most bizarre aspect of the trip came courtesy of the gentleman on the left. We rode next to him for much of the trip. When the humpback whales were sighted the boat came to a stop and everyone rushed to the railings. I suddenly noticed a large cloud of something appear in the air courtesy of this man who stood a couple of people down from me, but the wind brought it right in front of me and another lady. I couldn't figure out what it was. I started wondering if it was something to feed or attract the whales when it suddenly occurred to me what it was. I then saw another cloud of the same dust appear in the air in front of me and I started suspecting that the dust was actually blowing back in to me when the lady on my right exclaimed "Oh my God. I hope that's not somebody's ashes!" I looked down at this man and saw him emptying the rest of a large baggie of something over the side of the boat and felt pretty confident that this is exactly what he was doing. I then hoped a lot that the dust blowing back into me was just my imagination. I then tried to have positive thoughts that he was just granting someone he loved their final wish. Back on shore, we were delighted to see our step-mom, Joyce, and our step-sister, Lori. They live in California and drove over to spend the night with us and catch up on the good old days. It was a lot of fun seeing them! We also got to eat with them at Bubba Gump Shrimp Factory which is always a good thing to do. Life is like a box of chocolates.